Who wouldn't want a KO Kabuto with a fiercer horn, adaptive ammo switching, and rock-hard defense? Its enemies, that's who. 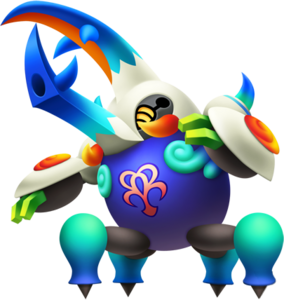 The Kab Kannon is a Dream Eater that appears in Kingdom Hearts 3D: Dream Drop Distance. It is obtained from an AR Card. The Dream Eater's name contains the Japanese words for "cannon" (大砲, Taihō?) and "rhinoceros beetle" (カブト虫, Kabuto-mushi? ), though its design is based on a Hercules Beetle, a species of beetle that is quite similar to the rhinoceros beetle. ↑ 1.0 1.1 1.2 1.3 Becomes available after unlocking Secret: Green at D-4. ↑ 2.0 2.1 Becomes available when in Ack-Ack disposition. ↑ 3.0 3.1 Becomes available when in Bodyguard disposition. The Kab Kannon can be created through a rank C recipe in the NA and PAL versions. The Kab Kannon Recipe can be purchased from the Moogle Shop. The Kab Kannon can be created through four different recipes. The first recipe is a rank D recipe. The fourth recipe is a rank A recipe. ↑ Will randomly shoot a Fire-, Blizzard-, or Thunder-elemental shot. This page was last edited on 3 April 2019, at 17:48.